Cyclic esotropia, a rare condition of obscure etiology characterized by regularly alternating periods of esotropia and orthophoria. 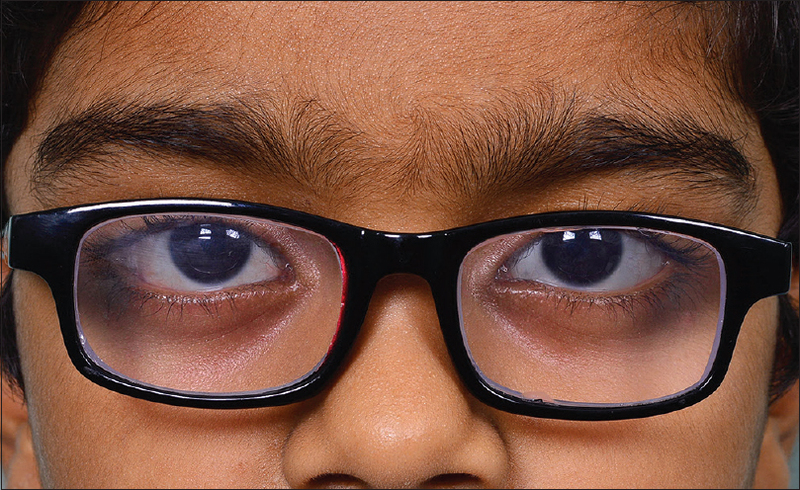 We present a case of a 7-year-old boy who underwent surgical correction for intermittent exotropia elsewhere and developed esotropia with cyclic pattern post-operatively. Initially the cycle was of half-day orthophoria and half-day esotropia, which later became one full day of esotropia and one day of orthophoria. During re-surgery, right lateral rectus was found to have a stretched scar which was resected and then advanced and medial rectus was recessed. Post-surgery the child was orthophoric without cyclic pattern. Cyclic esotropia is a rare entity. It is estimated that an ophthalmologist practicing squint needs to wait for 14 years to see one case of cyclic esotropia. It is characterized by regularly recurring esotropia with alternating intervals of esotropia and orthotropia in cycles of 24 h to 96 h patterns, most common one being 48 h. It is unrelated to visual activity, illness, or interruption of fusion thus differentiating it from other causes of esotropia seen intermittently. 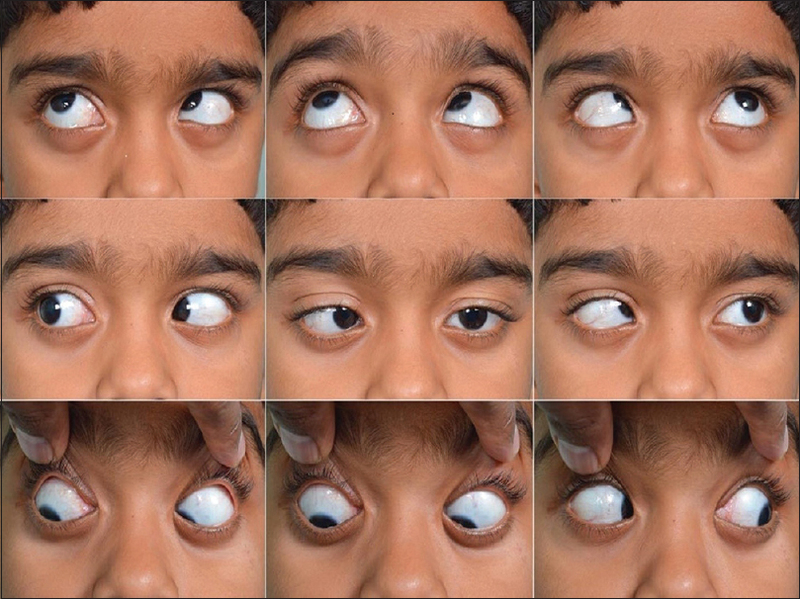 A 7-year-old boy presented with inward deviation of eyes since 1 year. 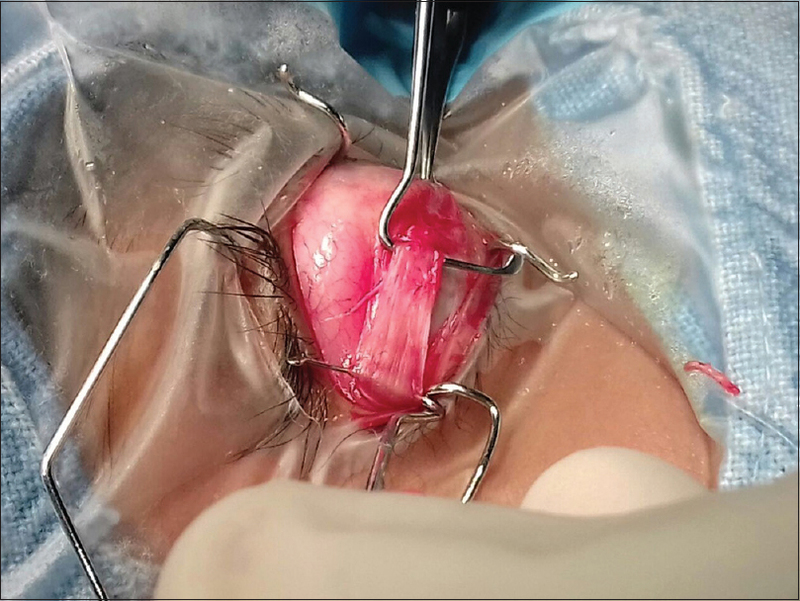 He had intermittent exotropia of 45 prism diopters (PD) with poor control since the age of 2 years for which he underwent lateral rectus (LR) recession 7 mm and medial rectus (MR) resection 5 mm in the right eye a year ago elsewhere. Few days post-surgery, parents noted inward squinting of the right eye in morning lasting for a few hours. Later squint was seen till afternoon and then straightened. Finally cycle of one full day of squint and no squint on the next day was established. His unaided visual acuity was 20/40, N6 in both eyes. Cycloplegic refraction with 1% atropine was +3.0 diopter sphere/−1.0 diopter cylinder at 180° in both eyes. We prescribed these glasses and advised parents to maintain a diary of when squint is seen and take photos at those times. We examined the child six times over 5 months. 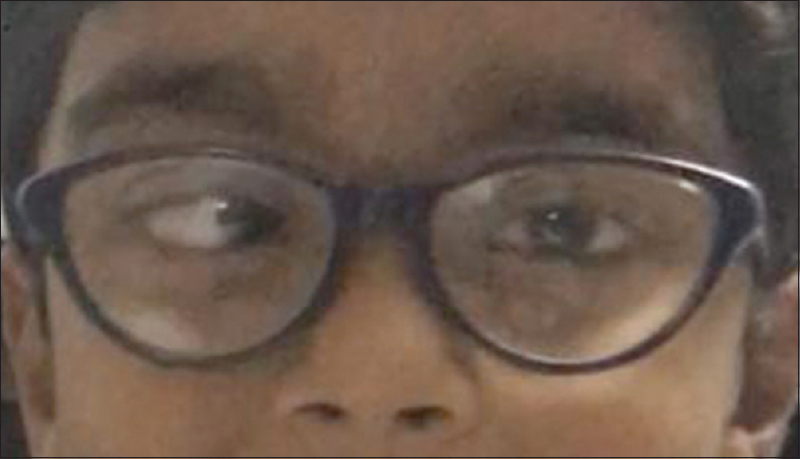 On the day of squint, with glasses, he had alternating esotropia of 50PD for distance and near with mild V pattern (up gaze 55PD, down gaze 45PD) and the left eye fixation preference [Figure 1] and [Figure 2] and deviation was the same with the right and left eye fixation. There was a mild limitation of abduction and mild inferior oblique overaction in the right eye, rest of the extraocular movements in both eyes were normal. Stereoacuity was 400 s of arc with the Titmus fly test. This could be due to monocular clues that this test offers. The child did not complain of diplopia on squinting day and there was no torsion seen on examination of fundus. On non-squinting days [Figure 3], he was orthophoric for distance and near with stereoacuity of 100 s of arc. Examination of anterior and posterior segment in both eyes was normal. After confirming the pattern of deviation, diagnosis of cyclic esotropia was established. He was advised to undergo surgery to correct the same. During surgery we found that right LR had a 7 mm long-stretched scar [Figure 4] which was resected and LR was advanced to 7 mm from limbus. MR was recessed by 5 mm in the same eye. At 1 month post-surgery visit, parents reported that the cyclic pattern of deviation was not seen anymore and on cover tests he was orthophoric for distance and near [Figure 5] with stereoacuity of 100 s of arc. Cyclic esotropia is a well-described entity but consecutive cyclic esotropia following surgery for previous exotropia is less known.,,, Probable reason for consecutive esotropia in our case was stretched scar in the right LR which correlated with limited abduction. For cyclic pattern, following theories have been proposed in the literature – aberration of the biological clock mechanism, central nervous system abnormalities (tumor, epilepsy), and increased accommodative convergence/accommodation (AC/A) ratio. In our case, there was no evidence of any such problems, hence the mechanism of cyclic pattern remains elusive. Treatment for cyclic esotropia is fairly well established. Helveston reported five patients of cyclic esotropia who were successfully treated by correcting the refractive error. Two of them had a high AC/A ratio requiring bifocals. This suggests that improving visual acuity or reducing the accommodation in those with high AC/A ratio can help in such cases and should be tried before surgery. Cole et al. have described case of cyclic esotropia in traumatic aphakia after failure to wear contact lens and got corrected after secondary intraocular lens implantation. This suggests that if visual acuity and fusion can be improved, it should be tried before squint surgery. Various case reports suggest that extraocular muscle surgery based on measurements of deviation on the “squinting day” gives excellent results, with no overcorrection on the previously “non-squinting” days., We also found good result with this approach. Consecutive cyclic exotropia developing after surgery for cyclic esotropia is known. This is more likely to happen if there is poor vision in the cycling eye. So patient may be warned of this possibility before surgery. According to Pott and colleagues, bilateral over-elevation in adduction and V pattern are common in cyclic esotropia. This phenomenon seems to develop during the course of the disease and is probably caused by loss of fusion. Horizontal surgery alone can restore fusion and can abolish the vertical incomitance completely. In our case also there was mild inferior oblique muscle overaction (IOOA) in the right eye with mild V pattern, but only horizontal muscle surgery led to collapse of V pattern and IOOA disappeared after surgery. Cyclic consecutive esotropia is a rare entity. Once the diagnosis is established, surgery is the definitive treatment based on deviation seen on “squinting day,” which gives excellent results and cyclic pattern gets abolished. We are thankful to the Hyderabad Eye Research Foundation for assistance in conducting this study. Helveston EM. Cyclic strabismus. Am Orthopt J 1973;23:48-51. Costenbader FD, Mousel DK. Cyclic esotropia. Arch Ophthalmol 1964;71:180-1. Muchnick RS, Sanfillippo S, Dunlap EA. Cyclic esotropia developing after strabismus surgery. Arch Ophthalmol 1976;94:459-60. Uemura Y, Tomita M, Tanaka YJ. 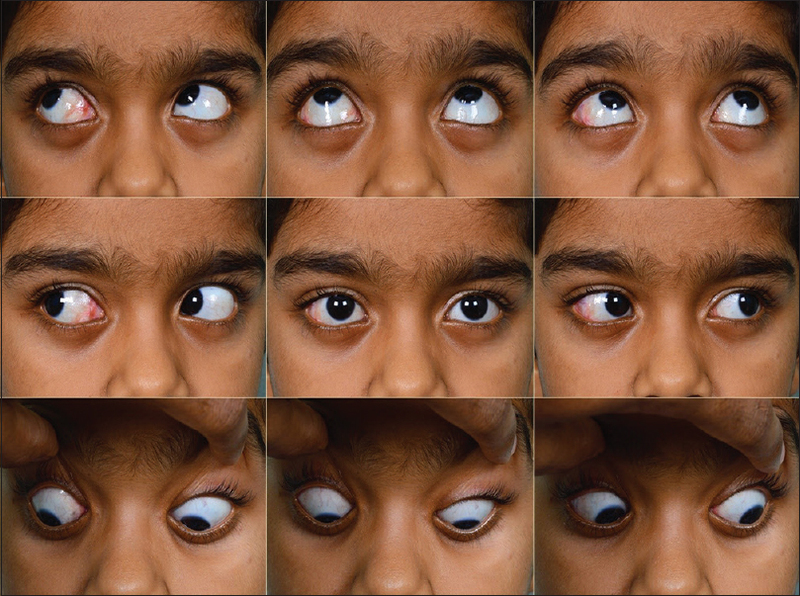 Consecutive cyclic esotropia. Pediatr Ophthalmol 1977;14:278-80. Wang X, Chen B, Liu L. Cyclic esotropia with development of a high accommodative convergence to accommodation ratio after surgery for intermittent exotropia. Int Ophthalmol 2017;37:1069-72. Ma L, Kong D, Fan Z, Zhao J. Consecutive cyclic esotropia after surgery for intermittent exotropia. Can J Ophthalmol 2014;49:e107-8. Pillai P, Dhand UK. Cyclic esotropia with central nervous system disease: Report of two cases. J Pediatr Ophthalmol Strabismus 1987;24:237-41. Cole MD, Hay A, Eagling EM. Cyclic esotropia in a patient with unilateral traumatic aphakia: Case report. Br J Ophthalmol 1988;72:305-8. Garg SJ, Archer SM. Consecutive cyclic exotropia after surgery for adult-onset cyclic esotropia. J AAPOS 2007;11:412-3. Pott JWR, Godts D, Kerkhof DB, Faber JTHN De. Cyclic esotropia and the treatment of over-elevation in in adduction and V-pattern. Br J Ophthalmol 2004;88:66-8.